It is copyright © Bob Arnold and Jacket magazine 2010. See our [»»] Copyright notice. Here is Hiking Down from a Hillside Sky. With introduction in place to assist the reader in. Note that Greg Joly printed for his design model all poems on the left page of the book at that slant. It wouldn’t look right out of the book design, so I revert back to my original here. Also note, if you didn’t find it on your own, there is a poem tucked inside on the front cover of the book, hidden under the dustjacket. It’s lovely working this way on the book because most miss the poem entirely, or find it after reading all the book and when inspecting how the book was handmade. There’s the poem! So it is meant to be read as an actual coda… so I have placed the poem at the end of the poems cycle… No Roman numeral to go with it. A lone wolf. For your own background on Joly, and a bit of my own history ~ Michael Tarachow once of Markesan, Wisconsin published four of my books letterpress and exquisite editions at Pentagram Press. Maybe you saw them back then? in the 80s. Michael would be up to all sorts of tricks as a printer, and now and then he would hide one of my poems either under a jacket or blind stamp a poem onto a fly leaf and just wait for some eagle-eye reader to locate it. Hayden Carruth was delighted one time that he found a poem like this in one of my books and had to write me immediately. Anyway, I told Greg about the Tarachow bag of tricks and I was happy to see him follow tradition with this book. Also, it was Tarachow who first brought to my attention, when typesetting one of my books in 1980, that a poem he was working on (“Dogs In Snow”) could go either forward or backwards. I nodded, “I know” (by letter) and proceeded to tell him about my backtrack life in the woods at work. It all made sense. It’s still making sense. When I was reading on the streets for making money to send down to New Orleans post-Katrina, Greg often read with me. I showed him the Tarachow trick with “Dogs In Snow” and Greg was hooked. The next week he showed up for our reading with a wad of papers in his satchel and it was the backwards typed manuscript of my original poems. Greg took it further. In woodslore life knowing the way in is only as important as knowing the way out. Backtrack. Understanding both ways of the trail. It is the same with some poetry — lines and development that are versatile enough to be read forward or backwards. Practical and experimental. Asking the poem/the trail to widen-out, to explore. 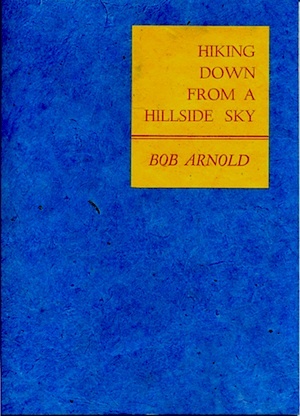 Over four decades of Bob Arnold’s poetry-trail in has been selected here to now backtrack out. Come along on this new way, or meet him halfway, or start from an opposite direction noticing the bent branch, a marker, stones left on the whichway trail. Guard the mysteries, constantly reveal them.